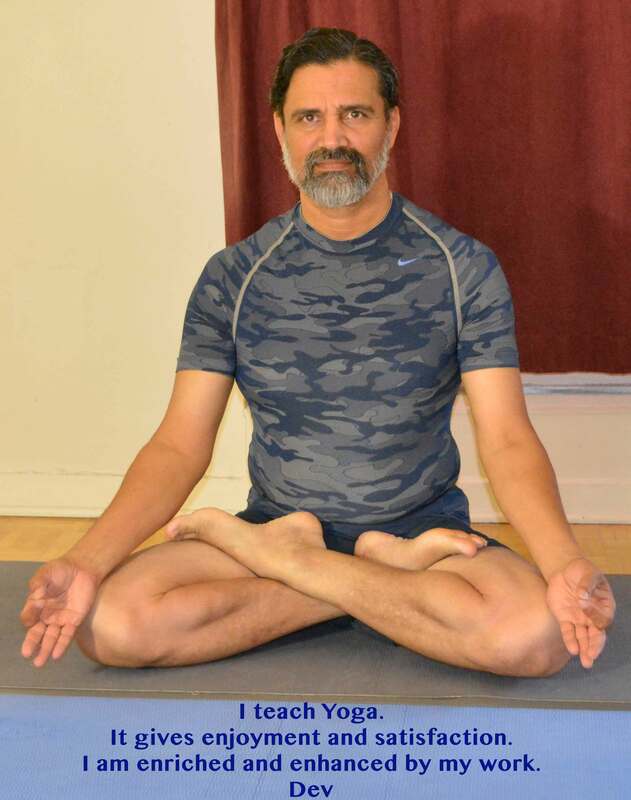 DEV - practicing Yoga from 1979 and Teaching since 1988; in Ottawa, ON, Canada since 2011. 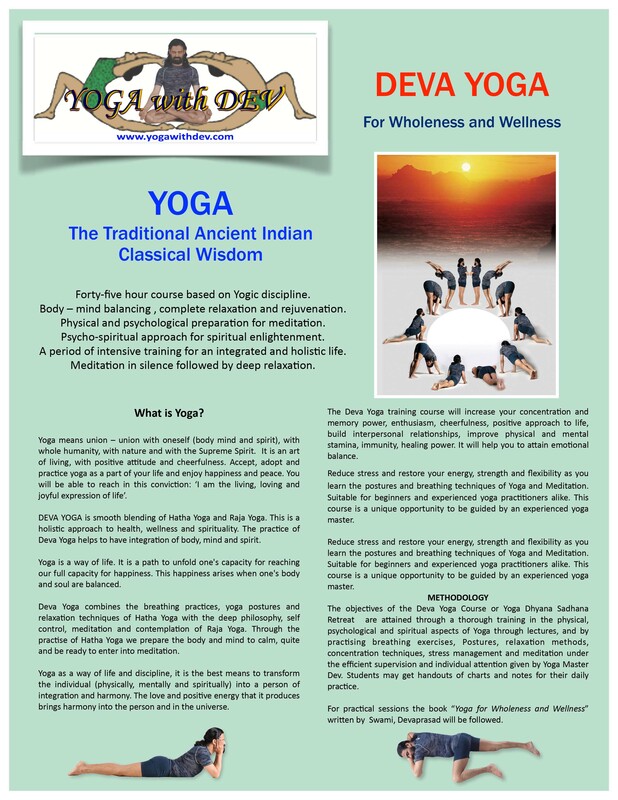 Yoga is the Traditional Ancient Indian Classical Wisdom. Yoga being one of the most holistic ways of integral commitment, it is also one of the greatest gifts of India to the world. Yoga is never bound by any one religion. It is meta-religious, beyond religion. All those who seek tranquility of body and mind with the universe should practice it. Having discovered this noble path to happiness through constant meditation and reflection on the highest, deepest and broadest possible meaning/s of their life experiences, the great Indian Masters shared this wisdom with others to bring about harmony and peace in individuals and in society at large. True spirituality is the state of everything being progressively integrated in love – a perpetual union of the individual, society, the environment and the universe. This union is already there, but it is realizable by humans provided we are constantly integrated, i.e., in Union. Yoga means union – union of the individual with the Universe, with the whole humanity, with nature and with oneself. This union leads to enlightenment and a life filled with happiness and positive attitudes. This website speaks about the convictions of the Yogacharya Dev. How one can have a holistic integration through the practice of Yoga, and embrace yoga as an integral part of life. There are several beginner yoga poses which is easy to practice for the beginners and those do not have any flexibility of the body. There are many who complain that their body is stiff and can’t practice yoga. This is a wrong idea. If they practice simple and easy posters daily gradually the muscles and joints will become flexible. Movement is the symbol of life; stiffness, stagnation or immobility is the symbol of death. In our day-to-day life we need proper and systematic movements of body. Lack of proper movements results stiffness and suffering. Therefore make a habit to practice simple yoga postures as part of daily life. There are several advance Yoga postures. With the practice of beginner Yoga postures one can increase the strength and flexibility of the body. Then the practice of advance postures becomes easier and more comfortable. The daily practice of Yoga helps the practitioner to be rooted in the soil of confidence, courage, patience and perseverance. BENEFITS OF YOGA, Physical and mental benefits of yoga. Daily practice of yoga helps to improve the physical stamina, immunity and healing power. 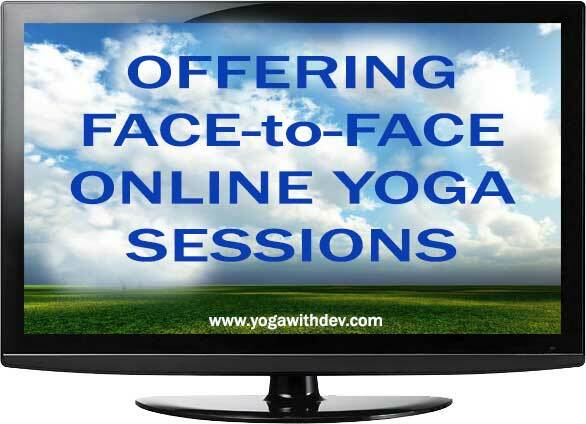 Face-to-Face Online Yoga: if you are a beginner or advanced yoga practitioner /busy to go to a yoga studio and if you need expert guidance at home; attend yoga sessions with Dev online. YOGA IN OTTAWA- PRIVATE YOGA - LEARN THE ART OF TRADITIONAL YOGA. Dev conducts yoga sessions for individuals or small groups in Ottawa. Private yoga sessions are the best way to learn yoga. Yoga for Yoga Teachers. Learn the traditional yoga with Dev. Teaching yoga is an art. YOGA-DHYANA-SADHANA is a one week retreat based on Yogic discipline, spirituality and meditation. YDS is a chance to learn yoga and spirituality; and different methods and types of meditation. Yoga Postures: Here there are examples for meditation postures, relaxation postures, beginner yoga postures and advance yoga postures. Health is our wealth. Our health is not only our personal property but also the property of our family, society and country. Any negligence to maintain our health is an injustice against our family, society and country. Meditation is continuous or unbroken flow of awareness (mindfulness).